This week marks the 50th year since the start of Israel’s occupation of the West Bank, including East Jerusalem, and the Gaza Strip. June also marks the 15th year since construction of the Annexation Wall began, and 10 years of closure/naval blockade on Gaza. Israel’s occupation and associated policies and practices fragment the Occupied Palestinian Territory (OPT), violate the collective and individual rights of Palestinians, and amount to colonialism. For decades, our organizations, along with UN bodies and experts, international organizations, and others, have documented and reported on Israel’s systematic breaches of international humanitarian law and international human rights law, and the resultant impacts on Palestinians. [i] Israel’s broad colonial aims towards the OPT, including East Jerusalem, and treatment of the indigenous Palestinian population are known and have been internationally condemned. After 50 years of occupation, which has been and continues to be the root cause of international crimes, the only question that remains is why the international community has failed to take concrete action. f. Release Palestinian prisoners and detainees, who have been unlawfully tried, including before military courts, and denied basic due process and fair trial rights, and ending the practices of administrative detention and trying civilians before Israeli military courts. 10) Cooperating with the Office of the Prosecutor of the International Criminal Court during its preliminary examination and all future stages on the situation in Palestine. A clear timeline must be established in order to ensure an efficient, just transition to Palestinian self-determination. Forcing negotiations which have historically attempted to equalize the roles and bargaining power of Israel, the Occupying Power, and Palestinians, the occupied population, will undoubtedly only perpetuate the occupation and lead to unjust outcomes. Israel’s unlawful acts should not be legitimized through land swaps and other pretenses established through the false rhetoric of the “peace” process. 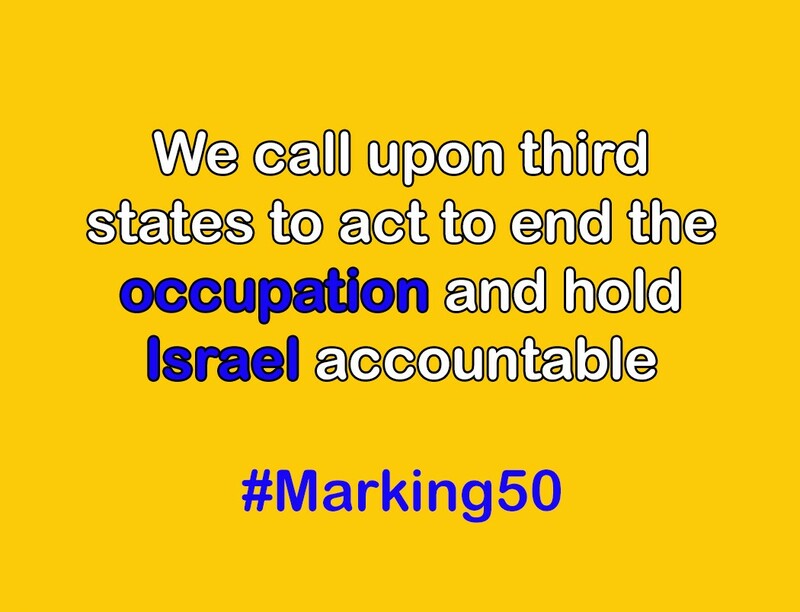 Fifty years after the start of Israel’s occupation in the OPT and nearly 70 years since the Nakba, the Palestinian right to self-determination must be recognized and achieved. Addameer, Al Dameer Association for Human Rights, Al-Haq, Badil, Community Action Center (Al Quds University), Civic Coalition for Palestinian Rights in Jerusalem, and Jerusalem Legal Aid and Human Rights Center. Palestinians are convicted at a rate of 99.74%.Official Report of the Work of the Military Courts in the West Bank in 2010 (Hebrew), published in 2011, Military Courts Report 2010. [i]These include Israel’s: excessive use of force, including frequent cases of extrajudicial or arbitrary killings; expropriation of Palestinian land for the establishment of unlawful settlements; exploitation of Palestinian natural resources; arrest and detention of Palestinian men, women, and children in the absence of basic due process and fair trial standards, including those tried in military courts; implementation of a discriminatory planning system, and the demolition of Palestinian infrastructure and structures; historic and continual revocation of IDs and residency rights of Palestinians; forcible transfer of Palestinians, including the targeting of Bedouin communities; collective punishment policies, ranging from movement restrictions to the holding of bodies of the deceased; frequent military assaults on the Gaza Strip, with resulting death toll and casualties, and Israel’s failure to facilitate entry of adequate reconstruction materials to rebuild; systematic de-development of the Palestinian economy and exploitation of VAT, customs and revenues; impunity for IOF soldiers and others who have committed crimes in the OPT; and countless other Israeli policies and practices which have obstructed the right to self-determination and impacted all aspects of Palestinian life and society.